When I was in New York this week, I decided to rent a bike and experience for myself all the new cycling infrastructure developments I've been hearing about for ages. I mostly wanted to check out the new and improved (depending on who you ask!) Broadway from Columbus Circle to Union Square. And since my time was limited, having a bike would also allow me to get where I needed to be for meetings and still explore parts of the city I wouldn't have been able to otherwise. 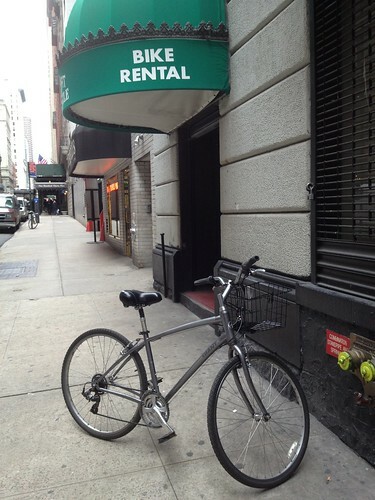 So I started by Googling places to rent a bike and decided on Bike Rental NYC on 57th Street, largely because I like the website and the price was good with an advanced reservation ($32 for the day). On the whole, I supposed I'd recommend this place - my bike (a Giant hybrid) was in good nick, and it included a nice Wald front basket and a heavy chain lock. The staff there weren't tremendously helpful or friendly, though, and I was a little put off at the start when the person behind the counter said that they rent bikes for a lot of different websites, so there didn't seem to be much if any connection between the site I was on and the store itself. The only significant issue was the quality of the helmets. Shockingly poor! I was thankful it was cold enough to warrant a wool stocking cap underneath because I wouldn't have wanted any of their helmets to touch my head directly. I'll bring my own next time. Broadway is tricky because it goes diagonally across the grid system of streets and avenues, but they've also done a good job with that, with infrastructure and associated signeage. The biggest problem I encountered was pedestrians on the cycle path. Hard to prevent I know, and it requires the cyclist to really pay attention - but that's always going to be a prerequisite to safe cycling anyway. A bigger problem was other cyclists heading the wrong way on the path. I can completely understand why you'd want to do it, but it's still annoying - particularly with almost all the offenders I encountered riding on the left for some reason, making each passing a game of chicken. Another strange thing was the pedestrian plazas that have popped up along the route - at several points, the it isn't clear where the bike path goes and you're left navigating between cafe tables and peds to get to the marked path on the other side. And finally, at the end of the path in Union Square, the whole thing ends abruptly, with no warning, no instructions, no thanks. There's a bit more marked bike lane on the East side of the square, but as you head back onto Broadway, there's no mention whatsoever of bikes. There is a bus lane that prohibits cars all the way downtown, and that provides a nice space for cyclists, but it's impossible to know whether it's strictly allowed or not. 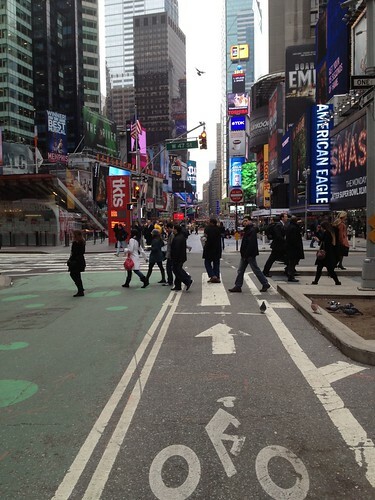 Once I'd arrived at City Hall, my Broadway exploration was over. 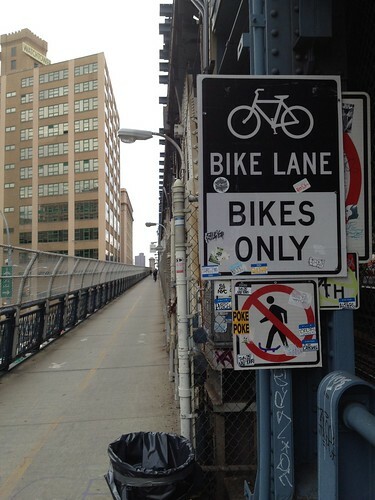 From there, I rode over the Brooklyn Bridge, which is one of my favorite things to do ever. I did a little circuit around my old neighborhood in Brooklyn Heights before meeting a friend for lunch on Henry Street. At his suggestion, I then rode down to Brooklyn Bridge Park en route to the Manhattan Bridge. It's a completely new park since I was last in Brooklyn. It seemed a little sparce that day, but it's got huge potential. Beautiful views of course, and lots of space right at water level. Seems very accommodating to cyclists and walkers. After exploring to the south, I turned around and headed north towards the Manhattan Bridge. When I reached the bridge, I asked a hipster DUMBO girl cyclist how to get to the bridge (not as easy as it seems when you're standing 200ft or so above the surface of the bridge! ), and she pointed to a sign... That was probably the first of a dozen signs over a quarter of a mile that eventually led me to the bridge entrance. Hurrah! The cycle track over the bridge was perfectly nice, with great views of course. Interesting that peds are supposed to stick to a different path, but as usually they do not. But not a big deal. The Manhattan Bridge pops you out in Chinatown, and I proceeded up Bowery with the rest of the traffic on a marked cycleway to a meeting with another friend until 4:30 or so. 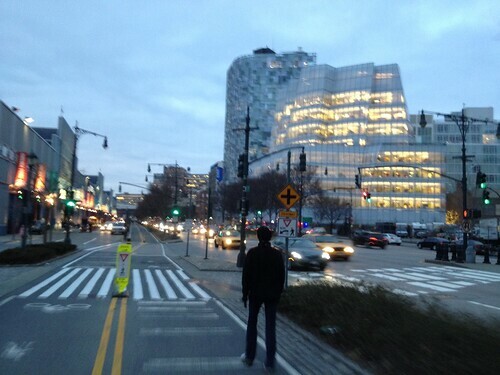 Then it was starting to get dark and I had to eek my way through the West Village over to the West Side to catch the Hudson River Greenway back up to Midtown to return the bike.